Wine for lovers, and lower blood pressure? While not everyone subscribes to the premise that consumption of red wine is why the French have lower rates of heart disease than some of their European neighbors (think “The French Paradox”), studies have shown that wine produced from red grapes increases the consumer’s HDL; i.e., the “good” cholesterol that helps to lower blood pressure. 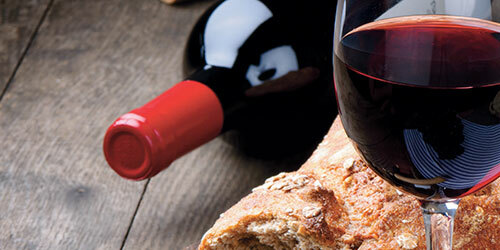 Another study also indicates the benefit of drinking red wine is especially noted in women 55 and older. Jamieson Ranch wines may be new to you; they were new to me when I first tasted them two months ago. But one sip of the Jamieson Ranch Double Lariat Cabernet Sauvignon from Napa Valley ($55) was enough to know I wanted more. I also liked their Whiplash Malbec ($15); it’s the substantial, affordable red that begs to be served with pot roast or steak. If you like pinot noir (and who doesn’t), then look for the Viansa Reserve Pinot Noir from Carneros ($45). It’s the perfect complement to salmon (score double healthy bonus points for this one) and roast pork. Looking for something in Italian? Look no further than the Tommasi Viticoltori Ripasso ($34). This only-produced-in-rare-vintage-years Valpolicella shows incredibly rich red flavors with subtle undertones in every sip. I suggest that you buy more than one bottle and let the extras age a few years. You also won’t be disappointed with the Tommasi Poggio Tufo Rompicollo ($18), a Sangiovese-Cabernet Sauvignon blend perfect with pizza and lasagna. And for that extraordinary, over-the-top Valentine libation, opt for the Taittinger Comtes de Champagne Rosé ($275+). Most rosé wines are a pale pink, but I recently had this one from the 1999 vintage, and it was red — not a dark red like cabernet, but red nevertheless. And every sip of that sparkling wine was an incredible treat. I wish I had a case in my cellar. Heck, I wish I had two cases in my cellar.